I LOVE making Easter goodies! 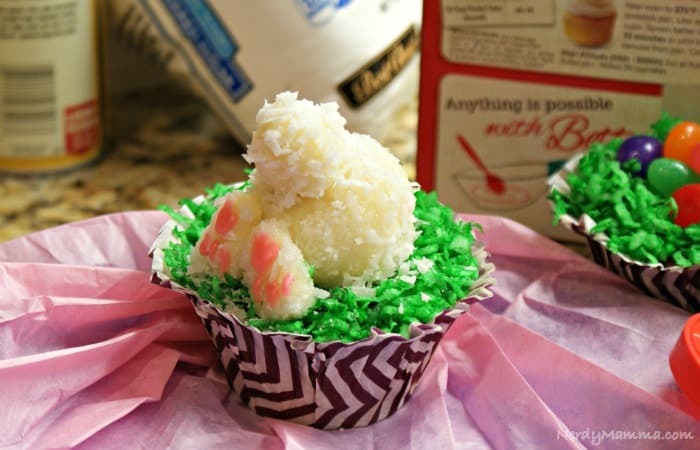 One of my very favorites (and the one that gets the most giggles from my grandson) are these Bunny Bottoms-up Cupcakes. When I was a kid, my mom used to make a cake (or cupcakes) that had green-tinted coconut on top, and she’d put miniature jelly beans on it and call them “rabbit eggs”. Well, I’ve done that for my own kids, and I even baked that same cake for my grandson a few years ago. (Just so you know, my grandson was not impressed by the cake.) But, please tell me, what kid doesn’t like a chocolate Easter bunny? So, I’ve combined the chocolate Easter bunny with my mom’s idea of an Easter cupcake. 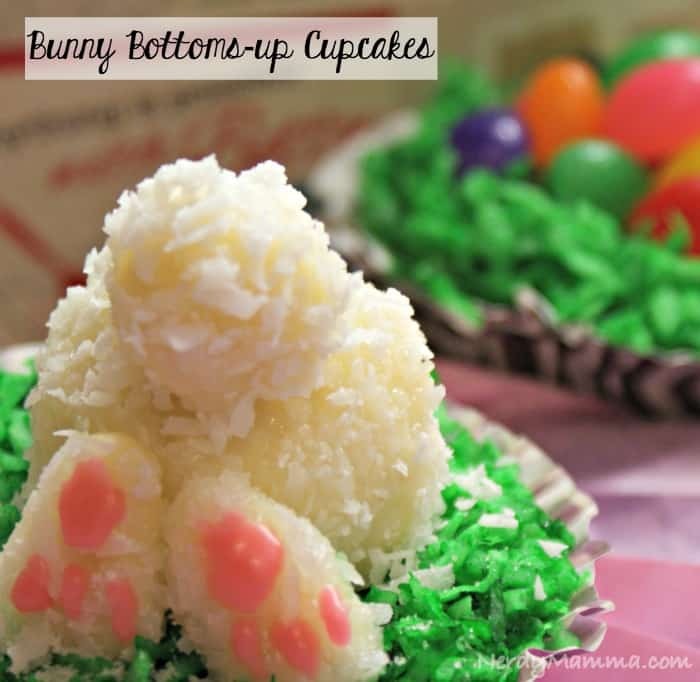 My grandson loves these cupcakes and the white chocolate bunnies that top them! Remove Karo Syrup from refrigerator to achieve room temperature. Preheat oven and bake the cupcakes according to the cake mix package directions. If you use the stand-up Muffin Cups, like I did, place them on a baking sheet before filling, and leave the baking sheet underneath them until the cupcakes are completely cooled. Put half the coconut in a zipper-style sandwich bag, add five drops green food coloring, zip the bag closed and shake until coloring is evenly distributed throughout the coconut. If the coconut is not a dark enough green, add more food coloring and repeat the shaking process. Set aside. Chop the remaining coconut into smaller pieces. Keep in mind that you don’t want the coconut pieces to be too small, just smaller than the green-tinted coconut you’re going to use for grass. Roll 12 balls of white chocolate (approximately the size of a ping pong ball) between your hands, until the chocolate balls are smooth and relatively round. Don’t worry if they’re not perfectly smooth or perfectly round–bunnies aren’t either! Roll 12 more balls of white chocolate to about the size of the end of your thumb. Shape 24 bunny feet, about the size of the first joint of your index finger. The bunny feet should be a little smaller on the end that will be placed “up”. Place 1/2 cup powdered sugar into a small bowl and add 1 teaspoon water, mix. The powdered sugar/water mix should be the consistency of pancake batter (easy to stir, but not runny). When you have the right consistency, add one drop of red food coloring and mix well. Place a toothpick in a zipper-style sandwich bag, and poke a hole in the corner of the bag, remove the toothpick. Place the pink icing in the corner of the bag, set aside. When cupcakes are completely cooled, remove the tops, using a sawing motion with a serrated knife. Frost cupcakes with chocolate cake frosting. Top chocolate frosting with green-tinted coconut. Take one large ball of white chocolate (rolled in step 5 above), and brush with Karo syrup. If the Karo does not spread easily, add a few drops of water and stir until well mixed. Then roll the bunny body in the un-colored, chopped coconut. This gives the bunny a “fuzzy” appearance. 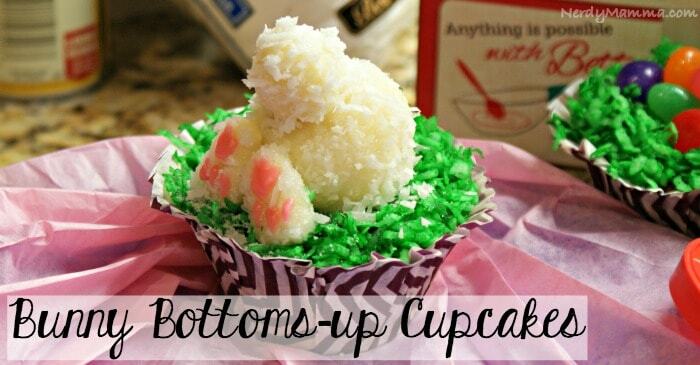 Set the bunny body on top of the first cupcake. Take one small ball of white chocolate (rolled in step 6 above), and brush with Karo syrup. Then roll the bunny tail in the un-colored, chopped coconut. Set the bunny tail off center of the bunny body on top of the first cupcake (You may need to hold onto the bunny body and kind of mash the body and tail together). Take one bunny foot of white chocolate (shaped in step 7 above), and brush with Karo syrup. Then roll the bunny foot in the un-colored, chopped coconut. Set the bunny foot to the left and below the bunny tail. Take another bunny foot of white chocolate (shaped in step 7 above), and brush with Karo syrup. Then roll the bunny foot in the un-colored, chopped coconut. Set the bunny foot to the right and below the bunny tail. Using the pink icing mixed in step 8 above, pipe toes and heel pads on bunny feet. Repeat steps 12 through 16, until all cupcakes are complete.